Official Car Mats is a UK Manufacturer Located in Blackrod. Official Car Mats was founded in 1991. The company initially served the automotive aftermarket, supplying car mats and accessories to auto parts shops and new/use car franchise dealers. In 1998 the company started to make officially licensed car mats with the logo of your favorite football club embroidered on the mat. What a way to support your club! Note: Official Car Mats makes car floor mats based on a right hand drive vehicle. 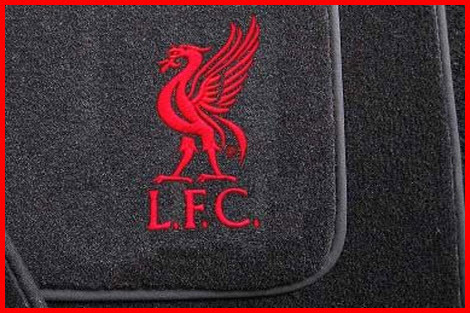 Official Car Mats Sports Branded Style Car Floor Mat with Liverpool Crest. Support your Club! Today Official Car Mats manufactures 3 styles of car floor mats in Blackrod, United Kingdom. They are all designed to provide an exact fit for your make and model vehicle. To start off the Plain Mat Line is just that, no fancy embroidery or logos or trims. Moving up, the Personalised Mat Line lets you custom design the embroidery and some other aspects of the mat. And ultimately, the Sports Branded Mat Line lets you choose a football club and design your mat from there. All 3 styles come with fixtures to keep your mats securely on the vehicles floor and help prevent mat slippage. All the car mats made by the company are designed for right hand drive vehicles. And you can pick the embroidery design you want on your front driver and passenger seat mats. All 3 styles of car mats are made with top quality materials. But you get to choose just how plush and lavish you want your mats to be. Three levels of mat quality are available for all 3 styles. Premium Quality mats are made from a 600 gram per square meter looped pile carpeting. A rubber granular backing made from recycled tyres is used to prevent mat slippage. Luxury Quality mats are made from a 900 gram per square meter tufted carpeting. It's more durable and easier to clean than the Premium Quality Mat. A rubber granular backing is used to prevent your mats from moving around on the vehicles floor. Super Luxury Quality mats use a 1300 gram per square meter, deep pile, tufted carpeting to give you the exhilarating experience you rarely get just by putting your footsies on a car mat. Super plush for comfort and to keep feet warm when cold. This quality of mat will also absorb greater amounts of dust, dirt and liquids the other quality mats. Official Car Mats Also Makes Rubber Car Floor Mats for the Messy Winter and Rainy Months. Plain Mats don't require a lot of work on your part. You select the make and model of automobile you need to purchase car mats for, and then select the quality of carpeting you want your mat to be made of. Then proceed to checkout. It's that simple. Personalised Mats require more information from you to uniquely design the mat you want. You enter make, model and year of your vehicle. You then select the quality of your mat which basically lets you choose the quality of the carpeting of which the mat is constructed. Mat qualities are explained above. Then you pick the mats carpet colour from black or grey, for example. Then pick the mat trim colour from one of the 15+ exciting colourful trim materials. Then you personalise your mat with text by specifying the color, font and text itself. You can personalise both driver and passenger side mats. Note: the cool thing about this process is that you can view what your mat looks like at any stage of the design. This lets you look at a lot of color and text combinations without having to buy the mats. Official Car Mats Sports Branded Car Mat with Wigan Warriors Crest and Moms Taxi Logo. And it's the Truth. Sports Branded Mats set you apart as a dedicated supporter and fan of your favorite team. Official Car Mats has spent over 20 years establishing relationships with some of UK's premier sports club just so you can have the club crest you want on your car mats. You pick your club, then proceed in a manner similar to the Personalised Mat. Pick carpet quality from premium or luxury, carpet colour, trim colour, text color and font and the text itself. You might even be able to put one club crest on the drivers mat while the passenger mat can have a competing crest if you call the customer support line and ask really, really nice. Talk about a house divided!